Though she mainly works from photographic references, Muhly will also paint from life if she deems it necessary and if the sitter is willing to pose for a session or two. Objectivity is her goal, as she strives to eschew fashion and prevailing tastes to get to the root of her subject’s true character and temperament. Besides oil portraits, she also works in pencil, charcoal, pastels and other dry materials. Oil portraits begin at $2,500 for a small head-and-shoulders piece; works on paper start at $500. 17 E. 96th St., at Madison Ave.
Catherine Stock’s portraits are more expressionist than formal. She’s painted kids at different life stages for parents who want an artist’s rendition of their children as toddlers, youths, and adolescents. Trained in Africa, she paints soft, impressionistic watercolors that capture kids in a relaxed mode. She’ll gladly sketch in your home, so the kids can turn on the tube and forget she’s even there. Portraits run $1,800 for a fourteen-by-seventeen. Specializing in charcoal, graphite, conté, and red-chalk pencils, de Montebello works from a castle in France for part of the year, where he sketches family portraits based on photographs you provide (taken by a professional, please). He’s related to the director of the Met, which might explain how he’s gotten to sketch so many of the rich and royal. When in New York, he always prefers to meet clients personally (right now, he’s here until March 2005). Prices start at $500 per person. Carnegie Hall, 881 Seventh Ave., at 57th St.
Painting likenesses for more than 30 years, John Howard Sanden has the best reputation in the business. 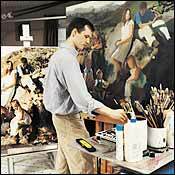 He has created hundreds of commissioned portraits, and relies on a mixture of sittings and photographic references to perfect a family’s masterpiece. Three or four 90-minute sittings are required. Prices start at $25,000 per person—and that’s just for head and shoulders! Linton certainly takes his time. Expect eight to fifteen three-hour sittings, either in his Chatham, New Jersey, studio or in your own home. He’s willing to work from photographs, but then prefers at least one sitting to capture the right colors and personalities. Head-to-toe portraits start at $15,000 per person, with each additional subject discounted at 25 percent. 1435 Lexington Ave., near 93rd St.
During your initial meeting with Raymond Olivere, choose your preferred portrait size as well as the degree of formality, background, pose, and attire. The second session is a two-hour photo shoot; he’ll create the painting using the resulting photos as a reference. Oil portrait prices range from $5,000 for head and shoulders to $18,000. Charcoal, graphite and conté sketches begin at $1,800. Shying away from the stiff and stuffy, Shelley Stansfield uses lively colors and strong brush strokes to create informal portraits. Consider “The Portrait Series,” several canvases of your kid painted from different angles. Prices start at $1,500.